Jabra EVOLVE 75 Stereo UC Headset (With Charging Stand) delivers world-class speakers and HD Voice technology that provides crystal clear calls and music. It is recognised to be the best wireless headset considering how it is designed to encourage focus and concentration in open offices and workspaces. It even featyres user-friendly audio control located on the headset. One of the most noteworthy characteristics that Jabra EVOLVE 75 Stereo UC Headset (With Charging Stand) has is its capability to promot better productivity through reduced noises and interruptions. The headset enhances productivity through the use of its superior Active Noise Cancellation feature, shutting off office noises. This feature uses advance microphones, the Hybrid 4 Mic ensuring 17dB (perceived cancellation in an office environment), to monitor and counter ambient noise and even eliminate low-frequency sounds, including hums of air conditioning. 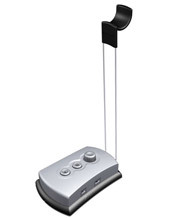 The headset is even integrated with a medium-length boom arm with nosie cancelling uni-directional ECM microphone. Jabra EVOLVE 75 Stereo UC Headset (With Charging Stand) reduces interruptions through the integrated busylight and the listen-in feature. This busylight acts as a “Do Not Disturb” sign that avoids interruptions and in the process enhances productivity. The headset is integrated with red lights on both ear cups that can be activated both automatically and manually, depending ont he user’s preference.This is also supported by its listen-in feature that can be used by having users press the left ear cup to hear the outside world without having to take the headset off, which ensures that users do not miss out important questions or announcements in the office. Jabra EVOLVE 75 Stereo UC Headset (With Charging Stand) provides customers with the freedom to move around their workspaces through its Bluetooth range of up to 30 metres. The headset delivers dual Bluetooth connectivity to two devices simultaneously that can be used for calls and music. Offering users with all-day comfort, the Jabra EVOLVE 75 Stereo UC Headset (With Charging Stand) is integrated with an on-the-ear design and leather-feel ear cushions. Jabra EVOLVE 75 Stereo UC Headset (With Charging Stand) is highly compatible with wide variety of platforms. 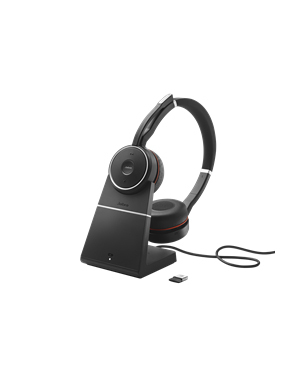 With this headset working with all the most popular online voice call services, it can also work excellently together with Skype for Business, GoToMeeting, Cisco WebEx, Google, ChromeBox, Fuze, ClickMeeting, JoinMe, Adobe Connect, eVoice, Onstream Meetings, and StartMeeting. 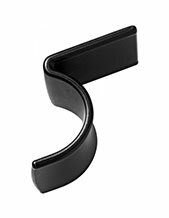 Founded in January 3, 1993, Jabra Corporation is one of the leading suppliers of hands-free communications products and solutions in the global market. 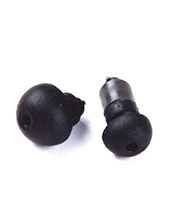 The company has around 1000 employees worldwide; supporting the company’s manufacturing floors, sales offices, and branches. A subsidiary of GN Netcom, it takes pride in its offers of broad range of corded and wireless headsets perfect for mobile uers and contact centre agents. GN Netcom is involved in the manufacturing of original equipment for global customers, including PC, PDA, and mobile phone manufacturers. Cutting-edge technology adn incredible effort are only few of the benefits that Jabra provides its customers, which is how its headsets are able to cater to the needs of contact centres worldwide.